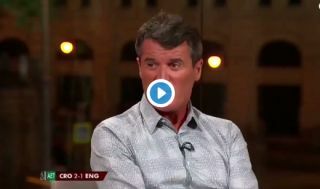 Fans may have been a bit down tonight after England’s World Cup semi-final defeat to Croatia, but this clip of pundits Roy Keane and Ian Wright arguing afterwards certainly cheered them up. Several people on Twitter seemed to really enjoy this frank exchange of views between Keane and Wright, and many pointed out it was reminiscent to those great Manchester United and Arsenal duels of old. Keane argued that England fans, including pundits like Wright himself, were getting too carried away about Gareth Southgate’s side’s success in Russia this summer. Making their first semi-final since 1990, many felt the Three Lions were in a good position to go all the way in the competition, but Wright insists no one was really getting arrogant, but merely enjoying the journey and the excitement of following the team – something that many would argue has been missing for a long time. That Roy Keane v Ian Wright fight has put the seal on it – best World Cup ever. Roy Keane and Ian Wright going at each other is the best. ?? Lmaooooo you guys are missing the best fight between Roy Keane and Ian Wright ?? ?